I'm not like typical professors, I suppose. Most professors help new trainers start their journey by giving them their first pokémon and a pokédex. I've never done either. I'm not one for sitting around a research lab and waiting for other person to come do my work for me. That probably comes off more harsh than I am intending, but it's true. I have respect for my colleges, but I prefer to do my own research. My name is Mattock L. Ginkgo and I research ancient pokémon no longer present naturally in our world, or in other words, I dig up fossils. (I am aware of the irony in the fact I'm named after a type of pick ax and pursued a career that requires digging.) I'm often out in the field, picking around in sedimentary rock layers, hoping to uncover something new or exciting in the world of pokémon paleontology. Field researchers like myself aren't as common as those who attempt to use our work to revive fossils. Fossil rejuvenation has become incredibly trendy over the last few decades, however it's still fossil jockeys and maniacs like me that continue to fuel that research. I have my own problems with cloning from fossils that I plan to bring to light, but I will discuss that deeper later on. I prefer more traditional research of excavation, cataloging, and potentially exhibition of fossils. Good old fashion museum work that I hope to continue for as long as possible. My goals are what have brought me back to Unova years after I left. A position has recently opened up for a paleontologist with the newly renovated Nacrene Museum. As much as I like the field, it would be nice to have an office to come back to after filling my pack with fossils. I don't suspect, given previous discussions with the director of the museum, that there is much stiff competition. Getting this position would also help me tie up some loose ends in Unova that I should have dealt with years ago. Here's hoping. The Alola region, like other regions, is home to a unique floral and faunal pokémon. However, one aspect that is currently unique to Alola (seemingly) are Alolan regional variations of already well known pokémon. Differences between related pokémon as a whole is not new, like the two formes of Gastrodon (and Shellos). 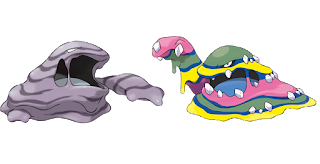 The East Sea and West Sea variations of Gastrodon are unique to the eastern and western portions of Unova respectively. 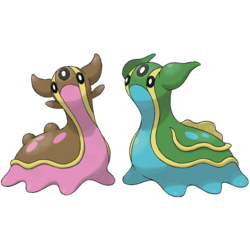 Unlike Alolan formes, the two formes of Gastrodon are not different outside of their physical appearance. Both formes of Gastrodon have the same typing, states, moves, and abilities. This is not the case for Alolan formes, which is why they are so unique. The West Sea Gastrodon (pink and brown) and the East Sea Gastrodon (green and blue). There are different types of speciation events that can result in various subspecies of organisms. In terms of Gastrodon, the two formes are a result of allopatric speciation. Allopatric speciation occurs when populations are separated geographically. For Gastrodon, they are geographically separated by Mt. Coronet, which splits Sinnoh in two. Once separated, the populations undergo genetic changes independently. If the populations do not merge back together, they may even become so different as that they will no longer be able to breed and produce viable offspring. Once this has occurred, the two subspecies are considered separate species. With Gastrodon, they can still breed, therefore they have not been geographically separated long enough to truly become two separate species. Alolan pokémon are similar in that regard. For example, an Alolan Muk can still breed with a standard Muk. Alolan pokémon, however, seem to have been isolated from their global counterparts longer than the two formes of Gastrodon. The morphological (size, shape, color, etc.) difference between the mainland subspecies and the island subspecies is very distinct. Often the differences go beyond simple appearances and extend to typing, abilities, and moves. Hypothetically, should the Alolan formes continue to be isolated from their mainland counterparts, they would eventually be different enough to constitute completely different pokémon species. It is possible that isolation events like these are what resulted in a lot of the morphologically similar rodent pokémon such as Pikachu, Emolga, Pachirisu, and Dedenne. These species can still breed, but they are distinctly different enough in morphology that the PokéDex considers them separate species. Like real world animals and plants, genetic work done on the electric rodents could potentially show that despite having very different morphological traits they are not true species, but rather subspecies (or in Pokémon World terms, formes) of the same species. Pokémon is TM and copyright of Nintendo. Picture Window theme. Powered by Blogger.